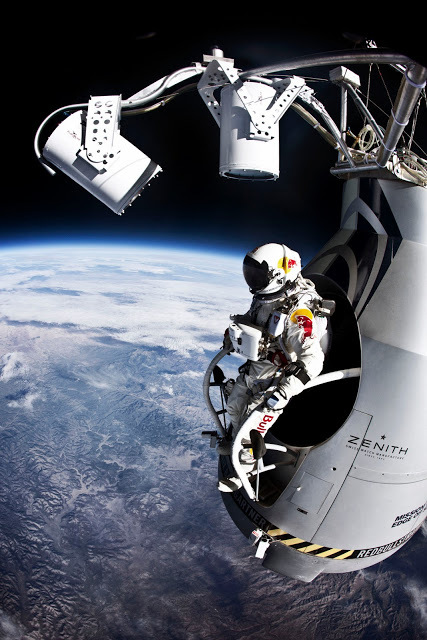 For the last three months, Red Bull has been doing some serious number crunching to get the official statistics for Felix Baumgartner's incredible Red Bull Stratos freefall jump from space. We were sent all the facts and figures in a massive press release yesterday but, to be honest, all the numbers made our eyes hurt. Conveniently, Red Bull are well aware that most people are lazy sods who don't like reading lots of words, so they made this dramatic CGI recreation of the event with some easy-to-digest figures. Bit of a shame they didn't recreate his worrying Mach 1.25 spin as he dropped to earth but maybe they're saving that for another day. Couple of things we did pick up from the press release that this video doesn't explain: Baumgartner's maximum vertical speed has been revised to 843.6 mph (up from 833.9 mph) but the distance he jumped has been recalculated to 38,969.4 m (from 39,045 m). So, much easier then.